Our practice is a specialty eye practice limited to the treatment of diseases and surgery of the retina and vitreous. 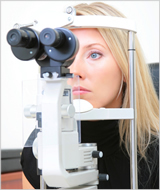 The length of your appointment can vary based upon the severity and complexity of your eye condition. As the practice is referral based, frequent and unpredictable emergencies are sent to Dr. Fern for immediate attention, our appointment schedule at times may be delayed. The average appointment length is two hours. On each visit a technician will check your vision and measure your intraocular pressure, followed by dilation of the eyes. 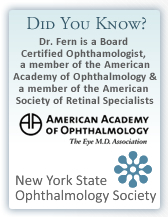 After a wait to allow your pupils to dilate adequately, you will be examined by Dr. Fern. Additional testing may be required. It may be possible for these tests to be performed and interpreted during the same visit.